As Office365 and other hosted Exchange platforms continue to attract more users, we’re starting to see more demand from customers looking for a way to keep an offline copy of their data ‘just in case’ the unthinkable should happen. MailStore is perfect for automating this process, and while there’s a good setup guide online to cover the basics, last week a customer called in asking for help with the more ‘niche’ requirement of setting up MailStore to archive email going to aliases in O365. 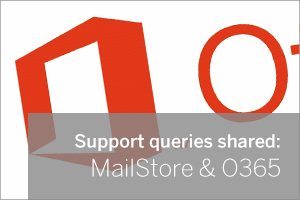 This customer had already configured MailStore to archive a selection of O365 mail accounts, including journalling to an external mailbox. In MailStore they had correctly configured a journalling archive job to collect that mail. However, it wasn’t long before they noticed that email sent to the aliases of the accounts they had set up weren’t making it to the archives of their users, and were instead being filed under the ‘unknown email addresses’ folder. Why didn’t MailStore know how to correctly deal with these messages? First take a look under ‘Administrative Tools > Users and Privileges > Users’ and you can see that the email address field is populated with the addresses that belong to users. This particular customer was using a local AD service to create his O365 users but as the synchronisation tool isn’t two-way, changes made to aliases in O365 accounts weren’t being reflected back in Active Directory – hence why we weren’t seeing them listed. To rectify this issue, each alias basically needs to be added manually to each account in Active Directory within the ‘attribute editor’. To do this you’ll need to open the Active Directory ‘user manager’ and edit one of the accounts in question as show below. The actual attribute that needs configuring is “ProxyAddresses”, and by default this will only include the main account email address. This is easy to spot in the future as it starts with ‘SMTP:’ in upper-case. To add an additional alias address you simply insert each alias address as a separate line, preceded by ‘SMTP:’ in lower-case. Remember, upper-case ‘SMTP:’ is reserved for the primary email address so should only exist once! After saving the new attribute to an account, simply run the MailStore directory services synchronisation manually and the alias address for that user will be populated and can be used to match against archived email for that specific user during the Journal job. Admittedly the customer I spoke to then had the slightly laborious job of adding a selection of message aliases for a range of accounts but it wasn’t long before these were all completely synchronised within MailStore. From then on any new email seen in the journal mailbox addressed to these aliases would appear within the MailStore archive for that user under an alias named root folder. With any luck, Microsoft will cotton on to the fact this is a slightly manual process and enable O365 so it reports back alias information but for now, hopefully this is a relatively easy workaround.